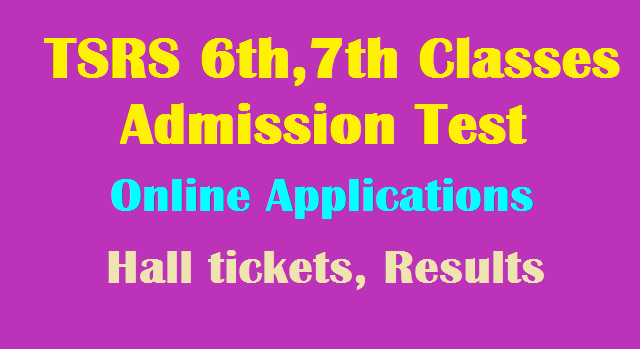 TSRS 6th,7th Classes Admission Test 2017, Hall tickets, Results @ tsrjdc.cgg.gov.in/ TS Residential Entrance Test 2017/ TREIS/TSRS 6th,7th Classes Admission Test 2017 Notification/ TSRS 6th,7th Classes Entrance Test 2017 Notification/TRIES VI, VII Classes Admissions 2017 Notification : TREI Society has decided to fill up the backlog vacancies in classes VI and VII for the academic year 2017-2018 in all 35 General Residential Schools District and also SC/ST backlog vacancies in 12 Minority Residential Schools through district level admission test. TREIS has issued the 6th and 7th Classes Admission Test 2017 notification on 06-07-2017 for admission into above said residential schools and Telangana Residential Educational Society invites applications from the eligible students for admission into residential schools. i) Candidate must have studied Class-V for the whole of the academic session 2016-17 in a Government/Government aided or other recognized schools. i) For VI Class: SC / ST students should have born between 01.09.2003 to 31.08.2007 and OC / BC / SC-Converted Christians (BC-C) should have born between 01.09.2005 to 31.08.2007.
ii) For VII Class: SC / ST students should have born between 01.09.2002 to 31.08.2006 and OC / BC / SC-Converted Christians (BC-C) should have born between 01.09.2004 to 31.08.2006.
e) Date of Admission test for both classes:22-07-2017. Eligible students may apply for this admission test on or before 17-07-2017. 2. For vacancies in Open category, all are eligible. are not available, such vacancy will be filled by BC-A candidates.